Alanis Morissette started acting at 10, had her own record company at 14, went platinum with her debut album at 17, and at 21 came out of nowhere (Ottawa, Canada) to sell 33 million albums worldwide with Jagged Little Pill. 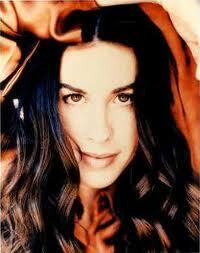 Morissette was born June 1st, 1974, at 9:39 AM in Ottawa, Canada. Alanis has the chart of an artist. Ascendant lord Moon is bright in a sign of Venus. Moon and Venus exactly oppose and mutually aspect each other in kendra/angular houses 4 and 10. Aside from being a Dharma-Karma Yoga (ruling houses 1 and 4), this is also a generic artist’s yoga. In fact, the very tight opposition between Moon and Venus also means that the two will mutually stimulate each other in all of the amshas/vargas, the harmonic charts so unique to Jyotish. Morissette’s birth time courtesy of Astrotheme.com. Note all planetary positions are with respect to the sidereal zodiac, as per Vedic astrology. Her 5th lord (where the mind goes, drama, spiritual practice) is Mars, debilitated in the lagna/ascendant, from where it aspects ascendant lord Moon. Mars was activated right from birth because Alanis was born into the dasa (major period) of an exalted Rahu, one of whose functions is to do the work of its dispositor Mars. Thus was born a spiritual warrior. Among the few yogas in her chart is a Viparita Yoga. Viparita is formed when all three trikasthana (6-8-12) house lords also occupy trik houses. Alanis has a perfect example. Mercury and Saturn, the 8th and 12th lords, occupy the 12th house. The other trik lord Jupiter, ruling the 6th, sits in the 8th from where it also happens to aspect Mercury and Saturn. All three trik lords are in trik houses, and further linked by Jupiter’s aspect. Viparita Yoga tends to cause a sudden and unexpected rise in life, often as the result of a mishap. Viparita means inverted, contrary, reversed. It’s the astro-logical equivalent of algebraic math, where multiplying two negative numbers produces a positive number. Her Viparita Yoga involves all three trik lords: Jupiter, Saturn, and Mercury, who just happen to follow each other in Vimshottari dasa sequence. That means that when her Jupiter dasa begins, its first three bhuktis (sub-periods) will be Jupiter, Saturn and Mercury. And when the combined periods of those dasa and bhukti lords run, they will bring the results of their Viparita Yoga – sudden unexpected rise. When Rahu dasa ended and Jupiter dasa began, the Viparita Yoga was activated. Alanis was 16. Within the next four years, she wrote songs and performed and made two dance/ballad albums under the name Alanis. In 1995, when she was 21, Jagged Little Pill was released under her full name, selling 33 million units worldwide, the biggest international debut album ever. Suddenly she was a major star. But what was the mishap out of which it grew? Alanis was mugged in 1993 during her JU-SA period but her reaction to it was delayed for more than a year, until Xmas 1994, after which she went through a long period of crying jags and fainting spells. Jupiter lord of the 6th brings confrontation and illness, while in the 8th, trauma. Saturn lord of the 8th in the 12th brings trauma, secret enemies, and loss, but also catharsis. And out of personal adversity came her fiercely creative reaction. In June 1995, just as she was shifting into Mercury bhukti, Jagged Little Pill was released. Mercury is the third trik lord of her Viparita Yoga, powerful in its own sign, and the strongest planet in her chart. During their bhuktis, both Saturn and Mercury do work for Rahu, because they occupy Ardra, one of Rahu’s nakshatras. Rahu in the 5th will express itself with drama (Rahu can be flashy), anger (Mars is Rahu’s dispositor) and angst (Rahu is deranged, and Mars is debilitated). Indeed, Jagged Little Pill summed up the anger and angst of adolescence. Since then, she’s gone on to write many other albums, and continued her acting career, appearing off-Broadway, in TV series like Nip/Tuck and Weeds, and in a number of films. She went into Saturn dasa in 2006, another of the trik lords that keep the Viparita Yoga going. Saturn as lord of the 7th house placed in the 12th is not a promising indicator of marital stability. Alanis was engaged for three years to actor Ryan Reynolds. Although they met late in Jupiter dasa, he broke it off early in Saturn dasa, in Saturn bhukti. It affected her deeply, and spurred more soul-searching and scathing songwriting. She’s since married and had her first child in Mercury bhukti. Just as JU-ME delivered fame and fortune, SA-ME delivered happiness in her personal life. Indeed, success of some sort is exactly what we expect from the bhukti of a strong planet. During its period, Mercury participates in the “turnaround” results of Viparita Yoga. It also works for its nakshatra dispositor Rahu in the 5th, thus producing romance and a child. What lies ahead? For the balance of Saturn dasa, let’s expect divorce and remarriage, and a continued career mix of music and acting. After age 51, in Mercury dasa, she’ll become a philanthropist, take up foreign residency, write a book, and disappear from the limelight to embrace spiritual life. thank you for a fascinating analysis of Alanis & her life. Especially interested to learn about this Viparita yoga thing which has had long last effects for her life. Its fun to know about her background & what spurred her creative endevors & also appreciate the ANALYSIS of what her future life will be…Leonard Cohen analysis was fab also!!!! Thank you very much for enlightening me.. In the circumstances you describe, with Sun in its own sixth, and Saturn in its own twelfth, this is more like a Viparita Yoga, since the two dusthana lords are mutually aspecting, so the period SU-SA or SA-SU may actually be beneficial. Other than that, SA dasa will give results for its nakshatra dispositor – MA, RA or JU – depending on SA’s degree position. Sorry not to be able to go into more detail, but it’s not the objective of this blog to interpret readers’ birth charts. Thank you for your observation. But this is a blog dedicated to Vedic Astrology. In that system, all planetary positions are calculated using the sidereal zodiac. This results in charts whose planets appear to be displaced approx 24 degrees earlier than they would appear in the tropical zodiac. In my earlier posts, I took pains to point out that the charts were sidereal, but after a while I stopped drawing attention to this point. Now I see that, for the sake of new visitors such as yourself, I should continue to highlight this essential difference. Thanks again. D-10 chart what does this mean? No, L3 is not involved in Viparita Yoga — only L6, L8 and L12 — the trikasthana lords. And you do not apply yogas like this — depending on house lordships — within any amshas/vargas. Just recently came across your blog, while starting to learn Vedic astrology. It’s super great! And one of the best blogs on the topic! You are an excellent and lucid writer!Helps in clearing up a lot of concepts as I am discovering Vedic astrology myself and as I try to understand my own chart! Since this blog topic is about Viparita yoga, I was hoping you would enlighten me on the Viparita yoga that was showing up in my chart. I am running – SA-MA dasha. Aries ascendant, Mars is in 6th house. Saturn is in 8th house. Jupiter is in 10th house. Since Mars is the lord of 8th house, Scorpio, and Mars is in 6th house, along with Saturn in 8th house, I am expecting the Viparita yoga to happen. In a lot of debt right now (Mars in 6th house effect), but I am hoping to overcome it by searching for a better job. Any other perspectives that you think would be helpful? Saturn is in its own Nakshatra (Anuradha), and Mars is in Moon’s nakshatra (Hasta ), with moon in 3rd house gemini(Punarvasu). Mercury is sitting along with Saturn in Anuradha. There is a Viparita Yoga here, involving ME 6L in 8H, and MA 8L in 6H, which is also a Parivartana Yoga involving an exchange between the 6th and 8th house lords. But you are not running the dasha of either. Therefore, if this Viparita/Parivartana is to be activated, it can only be within short periods of MA bhukti and ME sub-period, or ME bhukti and MA sub-period, generally only a few months at a time. Since MA bhukti gives results of MO L4 in 3H, it may require a relocation for you. MA is good in 6H, but because it is 8L, and operates within dasha of SA who occupies 8H, you may have on-again/off-again results. Look forward to ME dasha, MA bhukti for the real effect of Viparita/Parivartana yoga, even though that is many years away. Shorter but more immediate periods of success may come in SA-MA-ME or ME-ME-MA. That is so true. I had to relocate my apartment twice in the summer in the MA-ME period of 2 months. Damn!